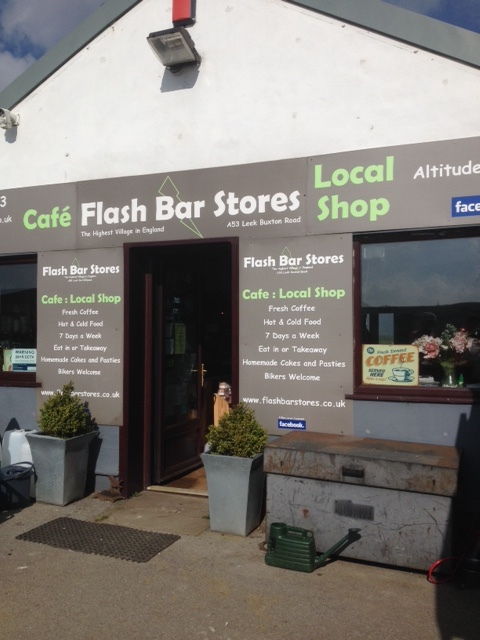 Our reward for this, and not to mention the climbs ahead, was a little stop at Flash Bar Stores, to stock up on water and, more importantly….FLAPJACK! We suffered bitter disappointment a few weeks ago when told there was none left, so unable to face that again, we phoned ahead to reserve some, much to the amusement of the lady who owns the store! It’s testament to how good it is, I told her! On our last ride there it’d had been colder than expected, so today’s conditions were a real bonus, virtually still and very mild. So the descent down to Longnor was not chilly at all, and the road along to Elkstones was a real treat, scenic and very quiet. 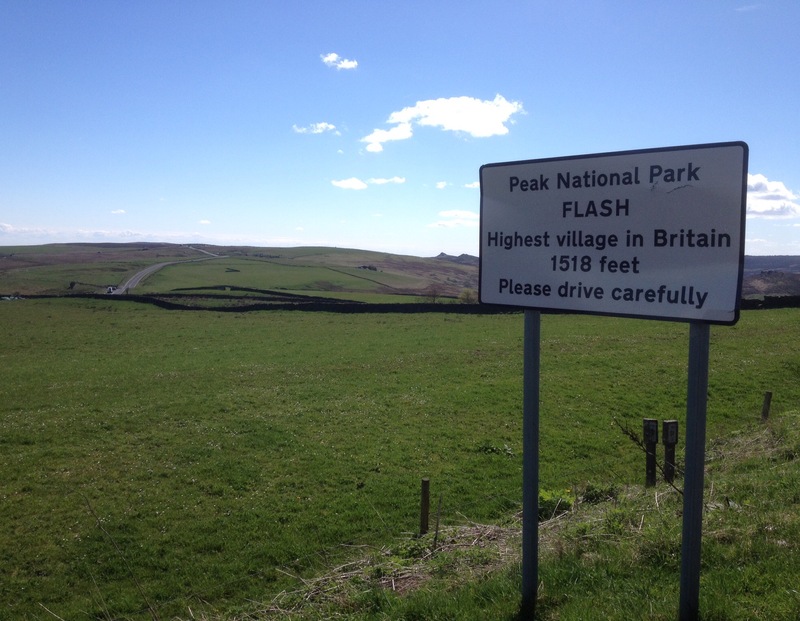 The climb up to Elkstones is steep, with gradients above 15%, which is tough on the legs after the previous 50 miles. To add to the required effort, Grant was greeted by a not so friendly collie who decided he might like to have a nip! No harm done thankfully and Grant waited for me to arrive, to make sure our canine friend didn’t chase me too! Out-sprinting a grumpy dog on this climb isn’t really an option!! I felt so much better on this ride than I had for the last few weeks. I rode fairly strongly, and didn’t feel too jaded as we returned home with 89 miles on the clock and approximately 2500m of climbing, according to our Garmin. Having had almost nine hours sleep the night before, combined with the super fuelling flapjack, I concluded that perhaps this is all you need for success in endurance cycling!! Only kidding…. 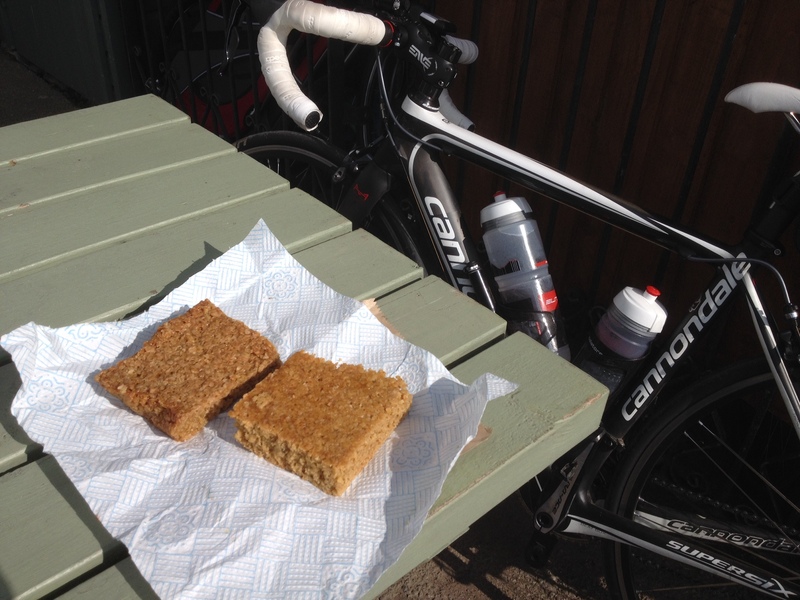 there are so many strands to training, nutrition, recovery etc…..I’m not saying you should eat a flapjack of this size every ride!! I guess my point is, that very often when you’re feeling out of sorts, or wondering why rides are not going well, it’s easy to overlook the basics, such as lack of sleep or general recovery. I’m now looking forward to a recovery week and catching up on some off the bike stuff!